All photos courtesy of the Sean Sexton Collection and The Irish Collection. These rare photos from the Sean Sexton Collection chronicle the years of terror following the Rising when the Irish were caught up in the War of Independence and the Civil War. You can read all you want of Irish history, but photographs give us a window to the past that words can’t. For the centenary of the Easter Rising, London’s Photographer’s Gallery put together an ambitious exhibition highlighting critical events that led up to the Rising, as well as photographs of the action on Easter week. In a matter of weeks, over 50,000 people had visited the gallery. The images displayed came from one source, Sean Sexton. His incredible collection of Irish historical images number 20,000. While no photographs of the Famine exist, Sexton’s eviction photographs from the 1880s, show the abject poverty and hopelessness that fueled so many uprisings that ended in failure before the eventual delivery of the Free State, to which the Easter Rising gave birth. On the phone from London, Sexton tells me that more exhibitions are planned to mark the upcoming anniversaries of the War of Independence (also known as the Black and Tan War), and the Irish Civil War, where pro- and anti-Treaty forces battled it out. It’s on these photographs that we focus on in this essay. The images in the following pages are the story. Who could not be struck by the look on Terence MacSwiney’s face as he is led away to prison, later to die on hunger strike after 74 days, leaving a wife and young daughter? How can you not get caught up in the image of the sentries standing outside J. Harris? How alien the soldiers look in this remote country village? We know from Irish history the reign of terror the British foisted on the Irish during the war years, so one can imagine what’s going on behind the closed door of the Harris establishment on the day of the raid. In another photograph, we see Michael Collins and Arthur Griffith leaving 10 Dowing Street, having signed the treaty that led to partition and the Civil War. Yet another image shows Portobello Barracks in 1922. It was from here that Collins set out on that fateful day in August 1922 to be ambushed and killed by anti-Treaty forces in rural Cork. You can catch Luke Dodd’s brilliant introduction to Sexton’s London exhibition on YouTube. For a thoughtful interview with Sexton, and earlier photos essays from his Irish collection, check out our archives at irishamerica.com. We thank Sean Sexton for his generosity in granting us permission to bring you these images. An unidentified man being arrested, though thought to be Terence MacSwiney, a playwright, writer, and politician. McSwiney was elected mayor of Cork City in March 1920. Arrested soon thereafter by the British on charges of sedition, he was taken to Brixton Prison in London. He died there in October 1920 after 74 days on hunger strike, bringing the Irish struggle worldwide attention. He was 41, and left a wife, Muriel Murphy, and a daughter, Maire. His sister, Mary MacSwiney, became leader of Sinn Féin when Éamon de Valera resigned the presidency of the party in 1922. Internment Camp Kilworth, located in North Cork. Kilworth housed approximately 250 detained persons during the War of Independence. British soldiers raiding party, Co. Cork, 1920. British soldiers halt for a fire on a country road during the War of Independence. 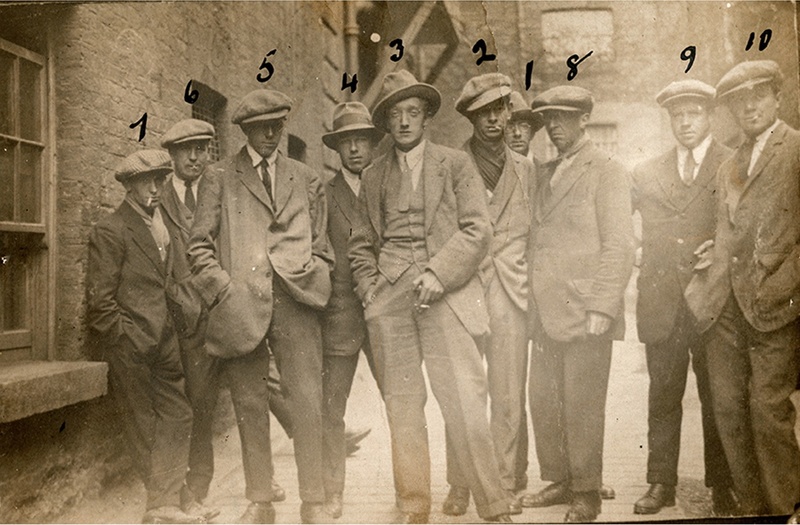 The Cairo Gang, British intelligence agents operating in Dublin during the War of Independence who were targeted by the IRA. Micheal Collins (right), together with Arthur Griffith (left) and Robert Barton, the other signatory to the Anglo-Irish Treaty, leaving Downing Street during the London conference.